Sydney, Australia 03 April 2017 - CADDIT announces an exciting new 3D CAD product agreement with ZWSOFT to sell and support all ZW3D products Australia-wide. Partner website www.3cad.com.au has been restructured to address specific requiremnts of 3D CAD users. ZW3D offers mechanical designers, engineers, machinists and manufacturers a powerful suite of integrated CAD and CAM software for parametric 3D part and assembly design, hybrid freeform and direct editing, sheet metal nesting and weldment construction, 3D publishing and printing, prismatic and multi-axis machining, lathe turning and more. 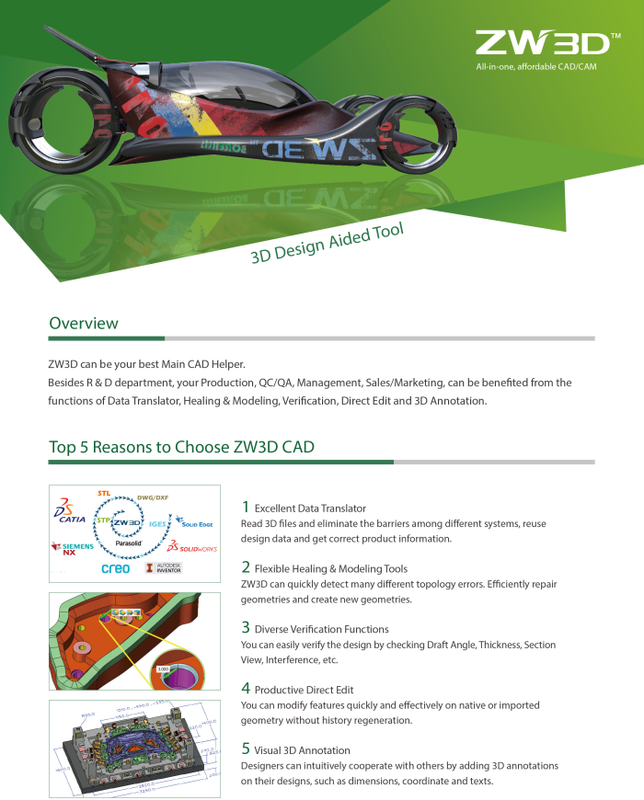 ZW3D also delivers powerful 3D CAD translation tools for importing SolidWorks, Solid Edge, Siemens NX, JT, PTC Creo, Autodesk Inventor, STEP, ACIS .sat and .sab, IGES and many more formats from even very recent versions of the software. ZW3D supplies thousands of businesses globally, including Yamaha Motor Co, Bridgestone, Johnson Controls, Baosteel and many others. ZW3D uses specially written state-of-the-art modeling technology, originally developed by VX Corporation of Melbourne FL USA, with software R&D still located in Florida to this day. The user interface includes a modern ribbon-based UI with visual help cues and prompts. Traditional bottom-up assembly design is offered in every version of the software without limitation. Standard and higher versions also offer advanced assembly options, top-down design and animation. There are also two CAM-specialist versions for CNC machinists at reduced cost in CAD features. CADDIT also announces a special price release of ZW3D 2017 for the Australian small business user called "Workshop". ZW3D Workshop by CADDIT edition will include all features of ZW3D Premium minus the costly electrode and mould tooling libraries, to be made available at a much lower cost.